Lost wax casting has been around for thousands of years. About 3500 B.C. 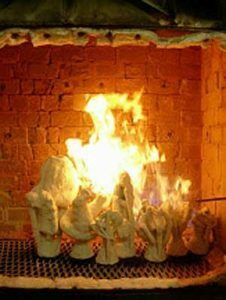 the earliest known lost wax casting was produced. Ironically the process has changed little since. The artist creates an original sculpture out of various media, including wax, clay, stone, wood or pottery. The sculpture is coated with a synthetic rubber molding material then cut in half creating a front and back piece for each mold. A plaster outer shell or a (mother mold) is used to provide stability to the rubber mold. Because of the mold, a piece of art can be re-produced many times. It is the only component in the process that is ever re-used. The inside of the mold is coated with a layer or two of wax. The halves are then bound together and the hot wax poured inside to complete the wax replica. 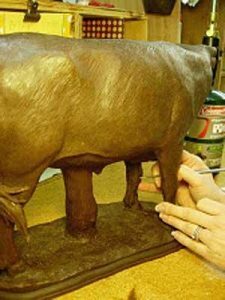 The replica is then “chased” to remove any seam lines, pits, bubbles, or other imperfections in the wax without changing the integrity of the artists original texture. 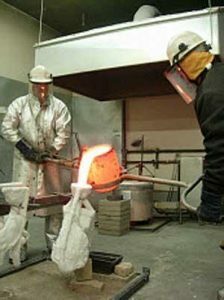 The quality of the finished bronze depends on this step in the process. This is the process of preparing the wax for the shell material to be applied. We attach the replica to a wax cup using wax rods (Sprue bars) at strategic places on the replica. The purpose of this is to allow for air venting, and also to enable the bronze to flow smoothly when poured. 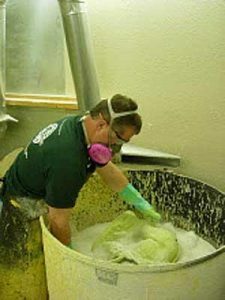 After the sprueing is complete, the wax is dipped in a liquid ceramic material then coated with sand and allowed to dry. This process is repeated several times. This creates a ceramic shell that can with stand the pressure and extreme temperature associated with the casting of bronze. The ceramic shell is then placed in a Kiln at a temperature of 900 degrees Fahrenheit. This flash- melts the wax out of the shell, thus the term “lost wax” is applied. The temperature is then increased to 1200 degrees Fahrenheit which cures the shell. The curing process strengthens the shell so it can withstand the molten bronze being poured into it. Bronze ingots and scrap are placed in a crucible and heated in a furnace to a temperature of 2100 degrees Fahrenheit. 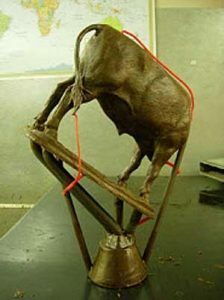 The molten bronze is then poured into the cured shells and allowed to cool. 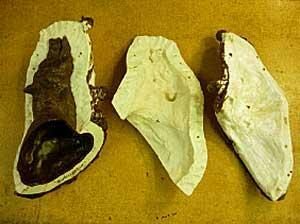 Once cooled the ceramic shell is completely broken away using an air hammer and chisel. The casting is then sandblasted with glass beads or sand to prepare it for metal finishing. 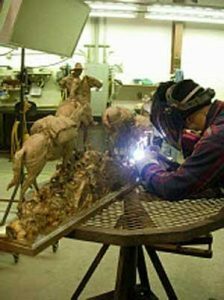 Pieces of a sculpture are then welded together and any imperfections are removed, and the artists original texture is re-created if necessary. Upon completion the sculpture is then sandblasted in preparation for the patina process. 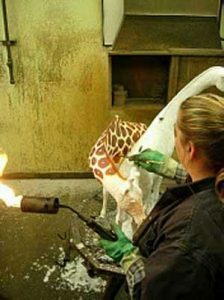 Depending on the finished effect desired, a torch is used to heat the bronze to necessary temperatures in preparation to apply various chemicals. The choices are endless, ranging from traditional bronze to full color effects. Depending on indoor or outdoor placement, there are several ways to seal the color of the patina for years of enjoyment.